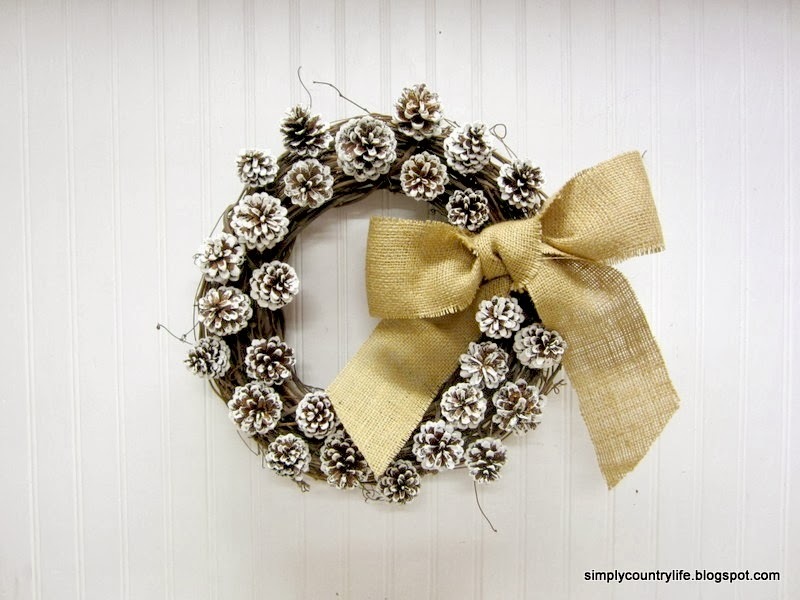 Here's another quick and easy, simple and neutral wreath. The inspiration for this wreath came from Pinterest. While I was browsing through some of my recent pins on my Christmas board, this one jumped out at me and I realized that I already had everything on hand to create it. You can check out some of the other great ideas I have pinned HERE. floral wire, wire cutters, hot glue and burlap. Begin your wreath by twisting floral wire around the base of each pinecone. Then attach the pine cones by twisting the wire ends around some of the vines in the wreath. Continue this process until the wreath is covered in pine cones. I also used some hot glue, just to help keep the pine cones in place, after they were wired in. Make sure to leave a little space open to have room to attach a bow. This bow is made from a strip of burlap that I cut and tied into a bow. You could also use a wide ribbon or another type of fabric bow. the back of the bow and twisted around some of the vines. So there it is. Rustic, neutral and simple. Just perfect for our little log cabin! Thank you so much Joselyn! Thank you so much JoAnn! Super cute! I love a pinecone wreath - pinned! Thanks for pinning Maryann! I love it too. Very cute! Thanks so much for sharing it at Knick of Time Tuesday! I love the simplicity on this, it turned out just wonderful, the white dipped pinecones is such a great look! Thank you Debra! I'm all about simplicity. Loving the pine cones- it always gets me so excited for the holidays!! Love this. Thank you for linking it up to Get Your DIY On! !